The first period was the difference. 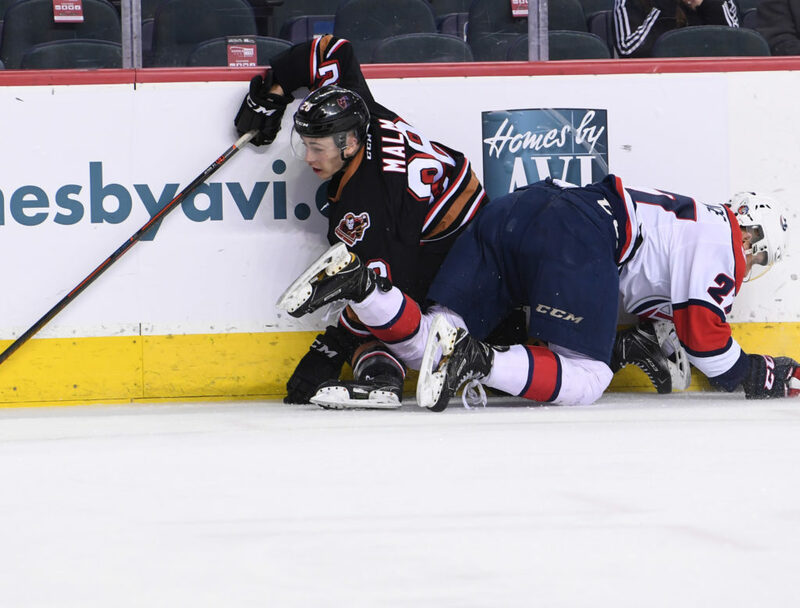 The Hitmen dropped a 6-2 decision to the Lethbridge Hurricanes Wednesday night which saw the ‘Canes score five goals in the opening 20 minutes. Riley Stotts and Ryder Korczak scored the two markers for the Hitmen which saw both Carl Stankowski and Brayden Peters see action. Stankowski made seven saves before being replaced by Peters in the first period who ended with 20 saves. Jake Elmer scored twice with Jake Leschyshyn, Jordy Bellerive, Taylor Ross and Nick Henry adding singles. Carl Tetachuk had busy night ending with 36 saves to earn the victory. The Hitmen were on their heels early on as Lethbridge started the contest outshooting the visitors 6-0 and opened the scoring just over two minutes into the game. After the Hurricanes made it 2-0 five minutes later, the Hitmen were able to capitalize on just their second shot of the night when James Malm found a wide open Riley Stotts who made no mistake in firing it into the open cage. The goal marked the fourth straight game that Stotts has scored and increases his point streak (4G, 8A) to eight games. Despite being back within a goal and a chance to tie it on a powerplay, the Hurricanes would turn the tables and score shorthanded which was then followed up with two more goals shortly after to take a 5-1 lead into the middle frame. The second stanza was a much different period as the Hitmen settled in defensively which was then capped off with Korczak being sprung on a breakaway after coming out of the penalty box and score top shelf to cut the deficit to three. A comeback wasn’t in the cards on a night like tonight as Lethbridge would find one more in the final 20 minutes to seal the deal. With the loss, the Hitmen now sit five points back of the ‘Canes for third in the Central Division and remained deadlocked for the first wildcard spot with the Red Deer Rebels. The next two games on the schedule for the Hitmen could prove to be the most important as they’ll take on Medicine Hat in a home-and-home set which starts Friday night at the Scotiabank Saddledome.